Like many Ultimate fans around the world, I closely followed both the WFDF U23 Ultimate Championships and the 2013 World Games. 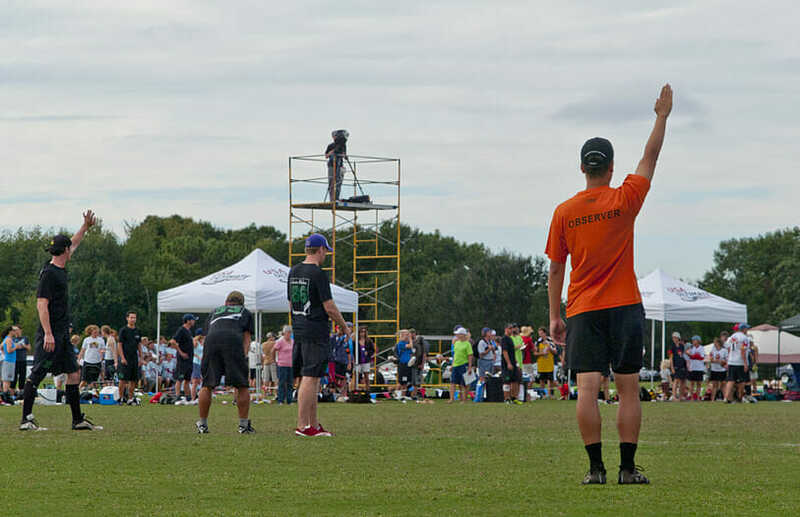 It was an unprecedented period of Ultimate coverage with nine consecutive days of Ultimate being streamed, as many as six games per day. I am, like so many, truly grateful to WFDF, the World Games, and their streaming partners to be able to watch such high level Ultimate from anywhere in the world. The availability of coverage of these events brought into stark relief the challenges that WFDF ultimate faces as it tries to present the sport to a global audience. The spectating experience of many games was marred with frequent and extended stoppages. These games crossed divisions and countries. At their worst — including the Japan vs. Canada U23 Women’s semifinal, the Italy vs. Colombia U23 Open pool play game, and the Canada vs. Colombia World Games bronze medal match — the stoppages and tedious resolutions overshadowed the play on the field and made those watching question the legitimacy of the outcomes of the games. In the final points of these games, there was significantly more time spent resolving calls than playing Ultimate. What makes this particularly tragic is that these games were some of the most meaningful, closely-matched, and exciting games in the moments where play occurred. Even when it’s not at its worst, every game I watched during the two tournaments had moments where players were not well positioned to make line calls, where teams had a differing understanding of the rules or how they should be applied, or continued to discuss a call when it was clear that no mutually acceptable resolution was possible. Unfortunately, some games also included intentional or repeated violations or misapplication of the rules. This is unfair to the spectators, who deserve to watch teams battle with their best; unfair to athletes who deserve to play the game they train for, have the results settled by that play, and have their wins and losses not called into question for process; and unfair to the sport as we try and showcase the beauty and uniqueness of both the play and the Spirit of the Game. These issues aren’t new to the sport at the international or any other level. That said, sometimes they are more visible in international play due to differing styles of play or rules interpretations regionally as well as language barriers. The biggest challenge though is that these games are being played on a bigger stage than ever before. I mentioned the unprecedented streaming above, but there were also reportedly over 10,000 spectators in attendance for some of the World Games matches. When very few spectators could watch live games, the burden of frequent and extended stoppages or clearly misapplied rules only impacted the handful of participants involved. Now, when games are watched by thousands or tens of thousands, the impact is much greater. I am a very strong proponent of player control, self-officiation, and SOTG in Ultimate. I have written a number of articles on the benefits of SOTG and self-officiation and techniques for teaching self-officiation. I’ve helped author the USA Ultimate’s Coach Development program which guides coaches on how to address SOTG, as well as the USAU’s Spirit of Coaching which establishes specific guidelines of spirited behavior for coaches. I am very proud that US National teams frequently finish at or near the top of the Spirit scores in international play while also competing at the highest levels. I believe that these aspects of the sport don’t just make the sport better to play and be a part of but also differentiate Ultimate in a crowded sports marketplace. The beauty of the observer system is that it is layered over the self-officiating process, which allows Spirit of the Game to not only continue but also to flourish. When two teams with high levels of rule knowledge, similar rules interpretations, and fair mindedness match-up, they can choose to not use the observers at all. This preserves the most amazing spectacle in team sports that Ultimate can provide – the joyful, respectful, highly competitive Ultimate match. However, when one or both teams don’t know the rules, are not fair-minded, disagree about how the rules should be interpreted, or face closely contested calls that neither team is willing to let go, observers can both keep the game moving and help to maintain a high level of spirit. This preservation of spirit is particularly important for both participants and spectators. Observers can act as safeguards that ensure that there are no egregious violations of the rules. This builds trust in the fairness of the game which in turn leads to players maintaining their own fair mindedness. Some will decry observers as leading the sport at the international level on the slippery slope to referees. I would argue that the opposite is true. We’ve all seen the challenges of self-officiation without observers. Currently there is no officiating model for high profile team sports beyond referees. If Ultimate continues on its rapid growth trajectory without presenting a viable alternative that safeguards SOTG and self-officiation, it is much more likely that there will be a groundswell of support for the known model of referees than for continued “experimentation” with observers. Over 10,000 people saw in person the deficiencies of pure self-officiation in the Colombia vs. Canada bronze-medal match that lead to (what they likely perceived as) their own country being wrongfully denied a medal in a prestigious international competition. Very few, if any, of those spectators have been exposed to the hybrid model of observers. Continued delay of implementing observers is more likely to lead to referees than implementing a successful observer system. Some may also object to observers out of concern that they will take the responsibility for fair play out of the hands of the players, a key element of SOTG. The primary use of observers, however, is to keep the game moving. The active calls that observers are responsible for in the USAU system are line and time limit calls, calls in which the observer can much more reliably provide best perspective. Active line calls prevent unnecessary stoppages and disagreements while active time calls (between points and on time outs) ensure that play restarts quickly when it does stop. Players are still responsible for playing by the rules; making stall, pick, travel, and foul calls; and playing fairly. In some situations, observers resolve calls that players make. USAU has a standard that an observer must be over 90% sure if he or she is making a ruling on a contested call; otherwise the play resumes under existing foul/contest scenarios. Having players initiate these calls with observers making rulings in cases where they are sure does no more to take responsibility for fair play out of the hands of players than the current fully self-officiated system does. The difference is that if players fall short of playing fairly, the observer system provides a safe guard on the game itself. – Players are often not in a position where they have perspective to make line calls. Giving that duty to a non-playing participant to make actively and definitively is preferred over letting out-of-position players make that call and dealing with the stoppages that occur when disagreements arise. – Players often have honest disagreements about what happened on close plays and ensuring that play restarts quickly in those occurrences is preferred over the occasionally long drawn out discussions and the very rare agreements that result from them. – There are occasionally situations where there are either egregious or repeated rules violations that have a non-incidental impact on the legitimacy of the competition itself. Having a third party present to make a call to ensure the legitimacy of the competition is preferred over a match losing that credibility but retaining full player control. I can understand if the debate here is heated. The vision of Ultimate with pure player-control is a beautiful ideal and a hard one to give up. There is a fear that safeguarding the integrity of the game by using third party officials will lead to the slow decline of spirit and result long term in referees. In USAU play, where observers have been used at the highest levels, we’ve seen the opposite to be true. Games between teams that would have been spirited without observers remain spirited, games where one or both teams that have shown lower levels of spirit are still able to have legitimate outcomes, and the game is more accessible and faster-paced for spectators. In the US, the sport is breaking in to the mainstream consciousness while retaining self-officiating and player control. While the debate over referees continues, it has existed since the origin of the sport. Observers have provided a viable model for protecting player control. The 2013 World Games is over and we now have four years before our sport will next be on the World Games stage again (Poland 2017). But we know those years go by quickly. Next summer’s WUCC and WJUC are right around the corner. WFDF need not implement USAU style observers immediately. A potential good first step would be to implement linesmen for 2014 events that can make active line and time calls and that could end foul/contest discussions after a set-period of time by treating it as foul/contest. This would remove some of the training barriers to observer implementation and allow WFDF more time to work through the standards for active rulings on contested calls. WFDF can gather feedback from event participants and spectators to track the progress of observer implementation while also continuing to train observers for major events in 2015 and beyond. Kyle Weisbrod is the coach of the U of Washington women’s team, Element. He has coached several teams including Monarch HS, Paideia Girls Varsity, and the US U19 Girls team. He began playing in 1993 at The Paideia School and has played for Brown University, Johnny Bravo, Chain Lightning, and Bucket. He was the UPA’s first Director of Youth Development and served on the Board of Directors. He currently resides in Seattle, WA and his articles are edited by the tremendous Diana B. Lerman. You can reach him by e-mail (kyle.weisbrod@gmail.com) or twitter (@kdubsultimate). Comments on "An Open Letter To WFDF: It’s Time For Observers"